Manage your workflow, from first notice of loss (FNOL) to resolution on a single platform that connects you with policyholders and service providers in real-time. stakeholders across the ecosystem, allowing you to reduce cycle times and improve the customer experience. Empower policyholders with real-time data capture and sharing, creating a faster and more accurate process. Connect stakeholders in a claim with access to all documents, photos, videos, notes, and sketches, creating trust and transparency. Automate pen and paper tasks with easy-to-use digital tools that streamline processes and improve collaboration. Get the information you need faster. Ensure accuracy to eliminate leakage and soft fraud, resulting in decreased costs and improved profitability. 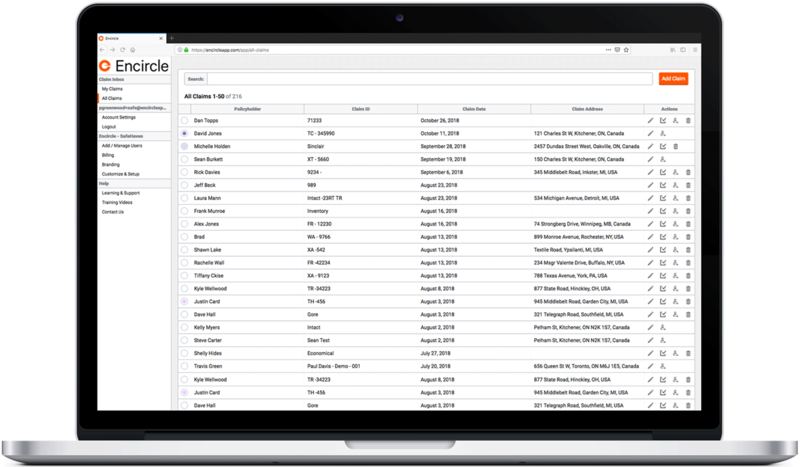 Share, receive, and save information from multiple parties in a centralized system allowing work in parallel. Link connects insurers to policyholders and service providers via text message or email, enabling quick photo and signature capture at the site of the loss. No more tedious pen and paper processes. Field teams capture information digitally and share with your claims desk instantly, eliminating costly delays. Create and send professionally formatted reports and forms with a single click from the field or office. With Encircle, insurance companies are increasing efficiency, reducing costs, and improving the customer experience. See how we're working with leaders in the space to transform the claims process. The use of Encircle significantly enhanced the customer experience, reduced claim severity, and shorted cycle times through improved transparency and connectivity during the claims process. Encircle helps insurers and restoration contractors improve efficiency and collaboration during the costliest disaster in Canadian history.